This tablet, once the schoolwork of a student in ancient Babylonia, is one of the most-reproduced cultural objects in Yale's collections. Thirty-eight hundred years ago, on the hot river plains of what is now southern Iraq, a Babylonian student did a bit of schoolwork that changed our understanding of ancient mathematics. The student scooped up a palm-sized clump of wet clay, formed a disc about the size and shape of a hamburger, and let it dry down a bit in the sun. On the surface of the moist clay the student drew a diagram that showed the people of the Old Babylonian Period (1,900–1,700 B.C.E.) fully understood the principles of the "Pythagorean Theorem" 1300 years before Greek geometer Pythagoras was born, and were also capable of calculating the square root of two to six decimal places. Today, thanks to the Internet and new digital scanning methods being employed at Yale, this ancient geometry lesson continues to be used in modern classrooms around the world. "This geometry tablet is one of the most-reproduced cultural objects that Yale owns—it's published in mathematics textbooks the world over," says Professor Benjamin Foster, curator of the Babylonian Collection, which includes the tablet. It's also a popular teaching tool in Yale classes. "At the Babylonian Collection we have a very active teaching and learning function, and we regard education as one of the core parts of our mission," says Foster. "We have graduate and undergraduate groups in our collection classroom every week." The tablet, formally known as YBC 7289, "Old Babylonian Period Mathematical Text," came to Yale in 1909 as part of a much larger collection of cuneiform tablets assembled by J. Pierpont Morgan and donated to Yale. 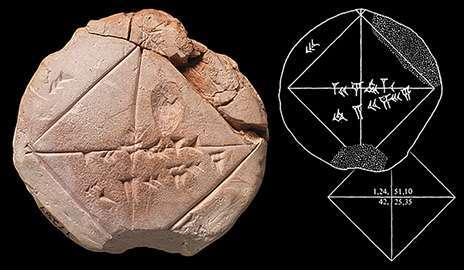 In the ancient Mideast cuneiform writing was created by using a sharp stylus pressed into the surface of a soft clay tablet to produce wedge-like impressions representing pictographic words and numbers. Morgan's donation of tablets and other artifacts formed the nucleus of the Yale Babylonian Collection, which now incorporates 45,000 items from the ancient Mesopotamian kingdoms. The importance of the geometry tablet was first recognized by science historians Otto Neugebauer and Abraham Sachs in their 1945 book "Mathematical Cuneiform Texts." "Ironically, mathematicians today are much more fascinated with the Babylonians' ability to accurately calculate irrational numbers like the square root of two than they are with the geometry demonstrations," notes associate Babylonian Collection curator Agnete Lassen. "The Old Babylonian Period produced many tablets that show complex mathematics, but it also produced things you might not expect from a culture this old, such as grammars, dictionaries, and word lists," says Lassen "One of the two main languages spoken in early Babylonia was dying out, and people were careful to document and save what they could on cuneiform tablets. It's ironic that almost 4,000 years ago people were thinking about cultural preservation, and actively preserving their learning for future generations.". Today, however, the tablet is a fragile lump of clay that would not survive routine handling in a classroom. In looking for alternatives that might bring the highlights of the Babylonian Collection to a wider audience, the collection's curators partnered with Yale's Institute for the Preservation of Cultural Heritage (IPCH) to bring the objects into the digital world. The IPCH Digitization Lab's first step was to do reflectance transformation imaging (RTI) on each of fourteen Babylonian Collection objects. RTI is a photographic technique that enables a student or researcher to look at a subject with many different lighting angles. That's particularly important for something like a cuneiform tablet, where there are complex 3D marks incised into the surface. With RTI you can freely manipulate the lighting, and see subtle surface variations that no ordinary photograph would reveal. Chelsea Graham of the IPCH Digitization Lab and her colleague Yang Ying Yang of the Yale Computer Graphics Group then did laser scanning of the tablet to create a three-dimensional geometric model that can be freely rotated onscreen. The resulting 3D models can be combined with many other types of digital imaging to give researchers and students a virtual tablet onscreen, and the same data can be use to create a 3D printed facsimile that can be freely used in the classroom without risk to the delicate original. While virtual models on the computer screen have proved to be a valuable teaching and research resource, even the most accurate 3D model on a computer screen doesn't convey the tactile impact, and physicality of the real object. Yale's Center for Engineering Innovation and Design has collaborated with the IPCH on a number of cultural heritage projects, and the center's assistant director, Joseph Zinter, has used its 3D printing expertise on a wide range of engineering, basic science, and cultural heritage projects. "Whether it's a sculpture, a rare skull, or a microscopic neuron or molecule highly magnified, you can pick up a 3D printed model and hold it, and it's a very different and important way to understand the data. Holding something in your hand is a distinctive learning experience," notes Zinter. Once a cultural artifact has entered the digital world there are practical problems with how to share the information with students and scholars. IPCH postdoctoral fellows Goze Akoglu and Eleni Kotoula are working with Yale computer science faculty member Holly Rushmeier to create an integrated collaborative software platform to support the research and sharing of cultural heritage artifacts like the Babylonian tablet. "Right now cultural heritage professionals must juggle many kinds of software, running several types of specialized 2D and 3D media viewers as well as conventional word processing and graphics programs. Our vision is to create a single virtual environment that accommodates many kinds of media, as well as supporting communication and annotation within the project," says Kotoula. The wide sharing and disseminating of cultural artifacts is one advantage of digitizing objects, notes professor Rushmeier, "but the key thing about digital is the power to study large virtual collections. It's not about scanning and modeling the individual object. When the scanned object becomes part of a large collection of digital data, then machine learning and search analysis tools can be run over the collection, allowing scholars to ask questions and make comparisons that aren't possible by other means," says Rushmeier. Reflecting on the process that brings state-of-the-art digital tools to one of humanity's oldest forms of writing, Graham said "It strikes me that this tablet has made a very long journey from classroom to classroom. People sometimes think the digital or 3D-printed models are just a novelty, or just for exhibitions, but you can engage and interact much more with the 3D printed object, or 3D model on the screen. I think the creators of this tablet would have appreciated the efforts to bring this fragile object back to the classroom."